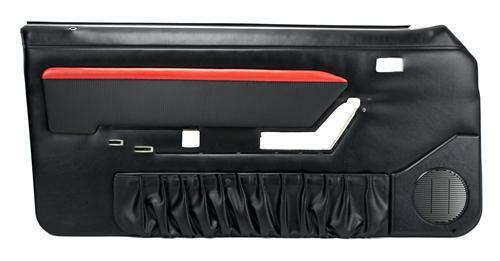 Add Mach 1 styling to your 87-89 Mustang with these black w/ red stripe door panels! 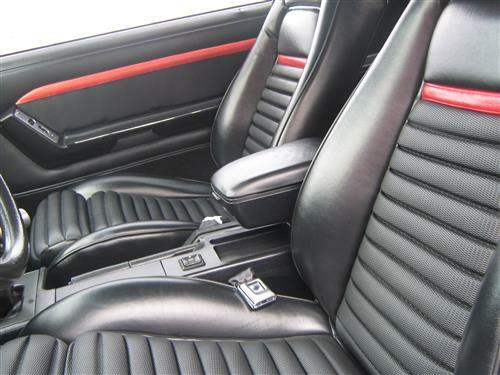 Matches Mach 1 Style Seat Upholstery! This pair of fully assembled Mustang door panels includes new inner door belt weatherstrips, door lock knob grommets, speakers grilles, & lower door carpet. 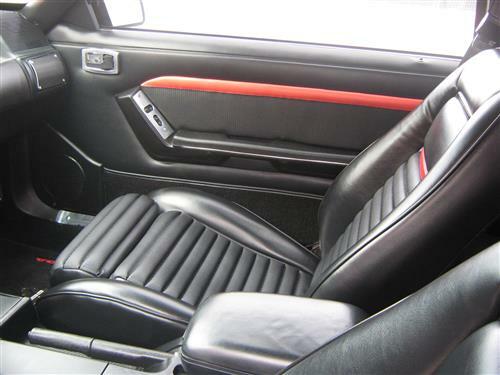 They feature an upper insert wrapped in black comfortweave with a red stripe to match the Mach 1 style seat upholstery. No assembly required, all you have to do is take them out of the box and install them on your Mustang. The door panel is not just there for convenience, it also serves an important purpose: blocking out excessive road noise that comes from the door cavity. Door cavities are a breeding ground for squeaks, rattles, knocks, and other annoying sounds. If your Mustang's door panel is ill fitting, not properly installed, damaged or missing these sounds will find their way into your interior and eventually drive you nuts! Do yourself a favor and pick up a set of these brand new, fully assembled, deluxe door panels. Install them with brand new door panel clips and drive your Mustang in peace! Your ears will thank you! - Door panels are shipped without holes cut in the vinyl for the arm rest, window regulator, switches or door handle. Precut holes are cut into the backer board for these accessories. When cutting the vinyl, remove as little vinyl material as needed to gain the proper clearance on the door itself. Cutting the vinyl to match the holes in the backing board can result unsatisfactory finish. Pictures are for reference only.